Melissa Alvarez is a world-renowned clairvoyant advisor, award-winning non-fiction author and romance fiction author who writes under the pseudonym of Ariana Dupré. In her readings, she uses several divination tools, but she is fond of consulting the runes as an oracle. The Norse word runa means a mystery or secret. Rune cave markings (dated 1,300 BCE) are the oldest depiction of these Norse symbols. Ancients believed that rune readers possessed great mystical powers. The Bible calls the runes an oracle for consultation. Many clairvoyants use this ancient tool to reveal secret messages and offer guidance to others. LTK: What do you find appealing about reading runes? Melissa: A rune reading tends to go deeper into the reasons why something is or isn't working for a person. It allows the person's situation to manifest through the symbols. Say you're having trouble with a relationship and I do a three-rune spread for you. This spread will reveal the situation as it is, the action you should take and the new situation that will arise. Let's say the three runes drawn are Hagalaz (as the situation rune) which means disruption, Odin (as the action rune), which means the unknown and Berkana (new situation rune), which means growth. This is oversimplified but Hagalaz shows disruption and problems. The rune Odin is the action you should take and often means that you have to give yourself up to total trust in what the Universe has in store for you - everything happens for a reason. With that trust in place, you'll be able to move into the new situation that brings growth of self and the relationship. Now, a rune reading has much, much more detail than this, but hopefully this gives you an idea of how one works. When you consult a medium for a reading, you may be offered a choice of divination tools or the clairvoyant will be guided to select the tool for you. LTK: What can a person expect from a rune reading? Melissa: You can expect to know the name of each rune that I draw and its Viking meaning. You'll know what position it was cast within the spread, an overview of the spread and you'll also get a detailed analysis of the situation as I'm seeing it clairvoyantly. LTK: How do you conduct a rune reading? Does the person need to do anything other than ask the question? Melissa: When I conduct a rune reading, I go over your situation focusing on your issue and asking that my hand be guided to the correct rune to help you before reaching into the bag to select the runes. When a rune feels right, I draw it from the bag and place it in its placement within the spread. I repeat this until I have all the runes drawn. Next, I tell you what each rune means and how it relates to your issue. For example, if you're considering a job change and I draw the rune Isa, this rune means that you're better off staying put for now. This is a time when positive accomplishments are unlikely and plans are put on hold. Now if this rune was cast in the middle position of a three-rune spread, it would tell me the action you need to take. In that case, you would still need to wait to change jobs. The meaning of all three runes together gives an overall view of which action you should take. LTK: What are some of the most common questions asked during a rune reading? Melissa: Most of the time, people are at a crossroads and are seeking a greater understanding of a specific issues, or they're confused about a situation and seek clarity. Some of the most common issues are relationships, confusion within self, major life choices and difficult decisions that need to be made. LTK: Can you explain what it means to do a Rune Casting? Melissa: When I cast the runes, I first decide which rune spread I want to use (three-rune spread, ten-rune spread, runic cross, etc). 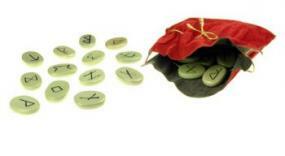 Once I've decided on that, I reach into the bag and move the runes around until I touch the one that feels right. That's the rune I draw and place in the appropriate position for the spread I'm doing. Next, I draw the second rune in the same manner. I continue to do this until the entire spread is laid out. I then read the runes. Depending on the spread, I'll either read from right to left or from left to right. I give the interpretation of each individual rune, the overall spread and any clairvoyant impressions or other messages I receive during the reading. LTK: Are there standard interpretations for reading runes or is it a combination of basic meanings? What you receive clairvoyantly? Melissa: I also listen to my guides when I'm doing a rune reading. So, if two runes together mean something to me on a clairvoyant level or I'm told to tell the person receiving the reading something from her guide because of those two runes being together, that's what I'll do. I'll do it even if it's not indicated in the meanings for the specific runes. Runes are a tool that aid a reading, not the be all, end all of the reading. LTK: With so many divination tools available, how do you determine when to use the runes instead of some other tool? Melissa: I advise a rune reading when the person has an issue that relates to uncovering how they should act/behave within a situation that's timely in the person's life. Are you stuck in a situation? Are you ready to make changes so you can get back on track in your life? Are you contemplating moving in a different direction but are unsure of making that change? Do you need more life guidance or want to understand your role in a given situation? Here's the thing though - you also have to be ready to face what comes up because in a rune reading, you may discover things about yourself that you don't want to admit to yourself. It's a powerful reading that can be healing and empowering to you. The main point to remember about a rune reading is that it's used for guidance; you can't depend on the runes to completely solve the problem for you. This is true with any reading using any divination tool. LTK: Which runes do you use? Melissa: I use the Viking Runes. The Viking legend says that Odin, chief of the Norse gods, speared himself to a tree so that he could understand the mysteries of the runes and gain knowledge. He passed this information to his people. 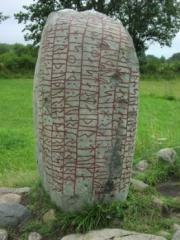 Vikings believed the runes to be a gift from the powerful Odin. Therefore, the runes possessed divine, magical powers. The Viking runes drew me to them. Maybe I have a past life as a Viking that I haven't remembered yet. LTK: As a clairvoyant medium, you use many divination tools. What distinguishes runes for you when compared to other divination tools? Melissa: With a rune reading, the information that comes through really makes you think and take a hard look at yourself and your actions. LTK: Do you have any advice for someone seeking their first rune reading? Melissa: Make sure you have an issue - not just a question - that you want to seek guidance about during your reading. Focus on that issue for a moment and then release the energy sending it toward the person who is reading you. Keep an open mind, take from the reading what feels right to you and apply it to your situation. I always suggest printing out the reading for future reference. As you can see in this interview: Reading Runes with Melissa Alvarez, there are many kinds of divination tools available for a clairvoyant advisor to use.